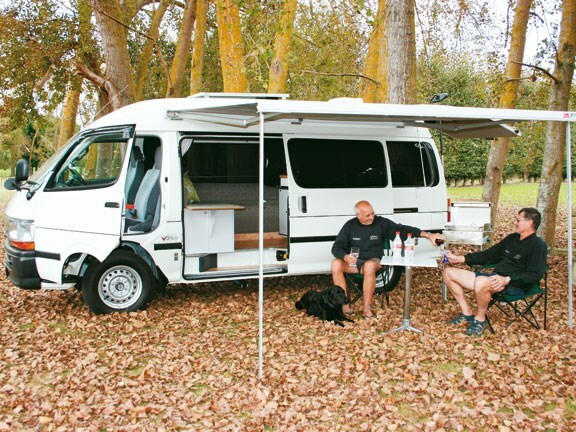 The team at Vanco Motorhomes Ltd has been producing motorhomes in one form or another for almost 40 years under the control of Robert Baillie, concentrating on the conversion of imported vans and buses ranging from six metres to 10.5/11 metres. This featured motorhome has been constructed with a 2004 Toyota long wheel base Hilux and has been built as a stock item that is for sale. The Toyota has been fitted out with what has proven to be the most popular appliances and layout relative to the cubic capacity, conveying a feeling of spaciousness inside the living area. The driving compartment is standard with a New Zealand-compatible stereo, air conditioning, and adjustable seats. Fit-outs and ongoing updates and improvements are usually sourced from staff ideas and customer requests. 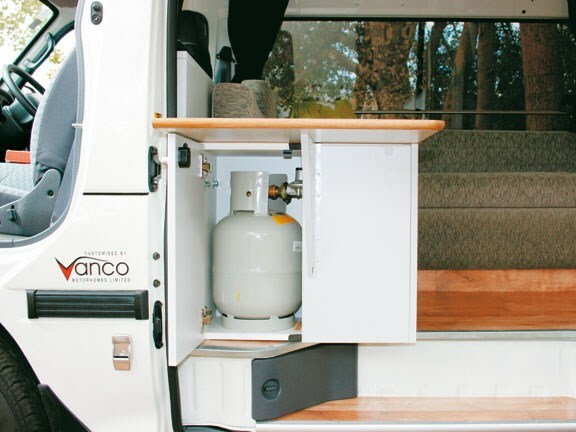 The van is powered by a petrol engine which drives through an automatic transmission producing a very smooth, quiet and comfortable journey on the open road. The two-berth home has a double bed that is made up of cushions and squabs in the living area and is accessible from the double sliding side door or the rear lifting door. A three-burner gas cooking hob is incorporated in the composite stainless steel sink, which has hot and cold taps and a folding water head. The gas cooker is powered by two 4.5kg bottles, also accessible through the sliding door. On the opposite side of the same door, a 60-litre Vitrifrigo 12-volt fridge is located and is set neatly into the cooking bench/sink facility. The interior of the home is ventilated by a manually operated vent in the roof, but the entire vehicle is heated only by the engine system. 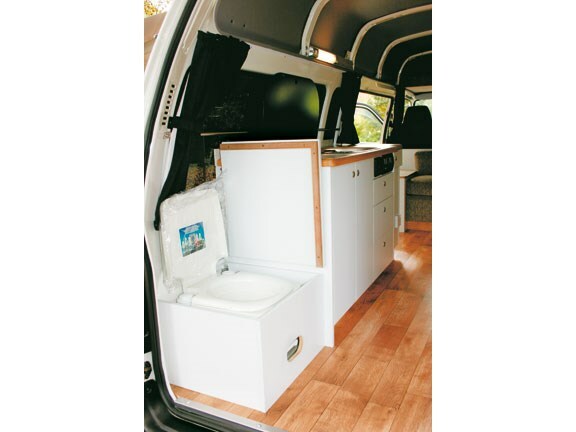 A Porta Potti 145 is hidden away in a locker at the rear of the living compartment and is covered by a padded lift-top seat. Water is supplied from a 60-litre fresh tank to a 60-litre grey tank and is fully pressurised to the sink and an outside shower head. A 10-litre hot water tank is also powered by the same 12-volt main water pressure system. The Toyota motorhome is charged by the engine alternator, a 90-watt solar panel on the roof and 240 volt mains supplies. The home has a separate 12-volt deep cycle battery. The electrics are controlled by a split charger and a smart charger and the engine battery can be charged by the same system if necessary. In the kitchen module there is gas for cooking and for heating the hot water supply for the sink and outside shower head. 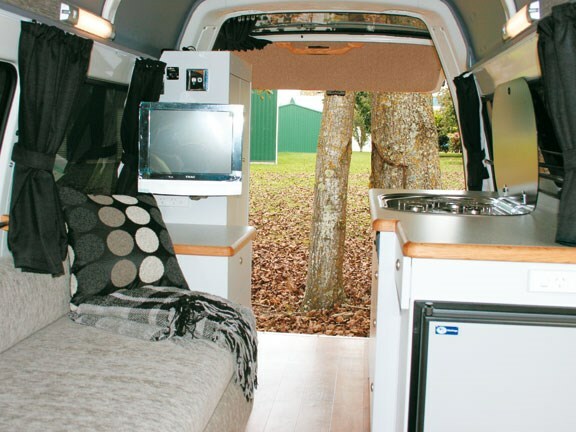 Passenger entertainment is supplied from the vehicle stereo with its two speakers and a 15-inch flat screen TV, and the entire living area can be privatised by a series of sliding curtains. Robert noted that the fit-outs and ongoing updates and improvements are usually sourced from staff ideas and customer requests. "We have a close association with Maui Rentals and we occasionally receive feedback from hirers regarding their thoughts on changes that would possibly benefit their use and these are, at times, incorporated into our spec product. They also made available to our customers during new construction or refits," he says. A three-metre Fiamma awning is standard on all Vanco motorhomes but this can be varied to suit any customer requirements and tastes. This 2004 Toyota low-kilometre motorhome with its brand new fit-out is priced at around $58,000, which can serve as a very good every-day domestic vehicle or a comfortable compact motorhome.